Welcome to September. It'll soon be winter! I've emptied all the bins and Angie has cleaned both gites. We have a couple arriving on Saturday and two next weekend so I'll have to clean one of the gites as Angie's away from Saturday. That will be it for this year. I fell asleep for an hour and a half after all that effort. I must inspect the gites now. I went to physio, then teh doctor (for a prescription), posted some letters and went to the chemist to get the prescription. I then phoned Lynne who met me at Joel's for lunch. "Why" I hear you ask? Well so we could go shopping after. We got home, brought the shopping in and then I stripped off and sat outside in the sun. Came in at 1730 to watch Flog It and then Antiques Road Show. Went shopping for the gite at 0900. I've got to look at the front suspension as the clanging noise is getting worse and louder. Let you know what I find. OK, found the bottom anchor for the wing stay had no nut on the end of the bolt. Also the bolt was a metric item. I replaced it with a BSF bolt, nut, flat and a spring washer. Did it up tight and the noise has stopped. I was then informed that Lynne's repeater for the internet isn't working. So, off we go to Angers for lunch and a new repeater. Get a Netgear item and spend the whole afternoon and evening trying to get it to work. Eventually with help from Simon it works. Now she's complaining the signal is up and down all the time. She wants to change it for an expensive one on Tuesday. My friend with the TC came round. He has a noise from the front of the engine which sounds like timing chain. I fixed the brake lights which were on all the time and found the oil on the dipstick was over the mark, which may explain the oil leak from the rear cork in the sump. I've advised him to watch the level and see how long it takes to get to normal. Didn't do much, it was cloudy and raining most of the day. Another day of doing nothing. I was going out but in the end decided that a little sleep was better. So slept two hours in the morning and then.... two hours after lunch. Left for Atoll at 1000 and went the back way past the bodyshop. Called in to say hello. Got to atoll at 1100 and went into Boulongier to change the repeater. Then had a salad with a jacket potato. Followed by a very sweet fruit desret and an Irish coffee. Got to the hospital for 1515, had a coffe and went in. Got to the MRI section and didn't have to wait long. Got stripped and into the scanner. Then it started whilst I listened to music. They then injected the soluton that lights me up and did it all again. I got dressed and we left. Home for 1700 and got the repeater installed. It doesn't work! So get a live chat session going with Belkin and after an hour she concludes there is a fault.... with the router. Say thanks and end the session. I've now ordered a TP-Link unit which will be here on Thursday. Went for a blood test at 0800 after checking the water level in the MG. After which I had two coffees in the cafe opposite the physio. Alex turned up at 0900 and started on me straight away. I get back for 1000 and start work on the car. I changed the wing bracket bolt for a larger one, then take the front carb off as the throttle is sticking. When it's off the throttle is free so I put it back on. After lunch I go out in the car and all seems OK. The clonking noise has stopped and the throttle isn't sticking but still opens with a jerk. Put the car away, sit outside for half hour and have to come in as it's far too hot. Sit down to watch TV but fall asleep. Oops, it's Monday 12th and I've fallen behind, not on my behind just behind. OK, we had to wait for the new router to be delivered before we went to Atoll to return the Belkin repeater, bought earlier in the week, from Boulangier. Instead we bought a new tablet, smaller than the one's we have so Lynne can take it to bed and watch her films. We had the mandatory chinese and came home. Installed the new TP-LINK repeater. It has a power cable to an adaptor which has two RJ45 sockets, one marked POE and the other LAN. I connected the POE to the unit and it powered up. The devices can see it but the router can't. At about 2000 I give up. We had to stay in as our latests guests will arrive "mid-afternoon". We gave the gite a quick dust down and put the towels in. Didn't do much, slept a bit and watched TV. They arrived at 1800, not mid-afternoon but not too bad. Simon dials in and looks at the new repeater. He says he has one in the office. Must be a differenet one as he can't get it to work. Started easrly cleaning the gite for todays guests. Angela is on holiday so we have to do it ourselves. The folk who were in there left at 0600, I saw there brake lights reflect in the bedroom windows. Simon dials in to my machine and between us work out that the repeater must be wired to the router. I get my long cable out and connect TP-LINK to router and plug the unit in the lounge. It works, takes a few minutes to connect but all the devices now work. I'll get a longer cable on MOnday and run it around the floor to the kitchen and fit the unit to the ceiling. Mid aftrenoon the phone rings and Lynne answers it. It's the guests who are in Noellet. She gives them directions but tells them to look out for the phone box, not a letter box. So they stop at the top of the lane and then drive on. Get to Arimialle and turn round and come back. By this time Lynne is standing in the road and directs them in. I give them my guided tour and leave them to it. Watch TV for the rest of the day, well between sleeping. I get the car out and remove the drivers side front wheel. Remove the hub nut split pin and tighten the hub nut and refit the split pin. Set off for Super U to see if they have long ethernet cables. On the way our guests, in a dark green MGB catch up and foloow me to the restaruant, to show themn where it is, and then to Super U. They, Super U, have a 10 m one but no connectors. I then decide to go for a drive so go along the dual carriageway to Segre. Turn off just before Segre and come back through the country lanes. The temperature is about 24c and it was raining enough to put the wipers on. Only they didn't work. The motor came on but the spindles are not tight enough and the blades only went half way across, and stayed there. I worked them by hand and then switched them off. When I got back I tightened the spindle but the wipers still don't work. I suspect it's the crap speaker cable supllied by Moss as a genuine wiper motor cable, It's nowhere near heavy enough to power a motor dragging wiper blades across a screen. When I got back I pulled up to the kitchen window and waited. Yes it staretd to boil. I left it there and after lunch checked the water level. It's OK so I won't worry too much about it. I may advance the ignition a tad more, when I've got time. The throttle is getting better, I can pull away smoothly now. It's now 0830 and I've caught up on the past few days. We're off to Atoll this morning to get a 25 m RJ45 cable.... and a chinese. Report back later. Got the cable and had a chinese. We drove through some light rain on the way so parked in the underground car park. It was still cloudy but very warm when we left but no rain. Got home and ran the 25 metre cable from the router along the wall to the kitchen door area. Fitted the repeater to the ceiling of the alcove. It gives "excellent" signal in the kitchen so all is good. So far I've done nothing other than have a haircut. Showered and dressed in a pair of shorts I sit outside listeneng to Joni Mitchell on my phone. It starts to rain so I come in and fall asleep listining to JM. Woke at 1500 for lunch, watched some TV then the heavens opened and we had a huge thunderstorm with hail and thunder and a power cut. IT's all quiet now and I'm typing this up at 1700. Will probably not get dressed today but just sit around doing nothing. Following phusio I made two phone calls, one chasing the tach-sent off on Friday so should arrive today, always arrives on Wednesday's when we're out. The other vto chase up the headlight glass. Apparantly the man that makes them is having production problems so the chap at S-V-C will chase him up and let me know by email. No email yet (Thursday midday) but the tacho was delivered and returned. We went to the fish restuarant by the river and I had six oysters followed by moules and frites and the fresh fruit salad. Lynne had steak and chips. After the meal we went over the road and sat down at one of the picnic tables where I fell asleep. The photo of me sleeping was on facebook last night. Lynne drove home. They are doing some building work in the town centre so the route we normally take was closed. We got lost and came back to the restaurant.... three times. We then found our way out but not the road we wanted. We came to a junction which said Laval and Angers to the right so we followed that and eventually came to the motorway and then were back on the road to Cande. I was woken at every roundabout and junction to ask which way, straight on until we get to Cande not being clear enough! Got home and I went to sleep for an hour, Watched TV for the rest of the evening. Had to empty all the bins as they wer full. I stopped at the postbox on the way out and found the ticket informing me a parcel was delivered but as we were out it's at the post office in Combree. I put the rubbish in the recycling bins then went onto Combree. Sorry, it's back on the van now, will be delivered today. So, as it's a lot cooler and I feel a lot better than I did in 30c heat, I painted the ceiling that was water damaged a year ago, I keep telling her not to nag, I will do it, eventually. Then I removed a dead mouse from between the bookcase and the wall. I have a picture to hang so must find a hook for that. It's now 1250 and I'm waiting for the tacho to be delivered so I can refit it. I've got to remove the clock, wire it to live and earth and then spin the balance wheel to start it. The hard part is keeping it earthed as I refit it. The earth wire goes on one of the screws that holds it in the tacho. I have a length of wire with crocodile clips which I'm going to try and clip to the clock for an earth whilst I refit the screws and get the earth wire on the screw. I'll report back later. The postman came at 1405. He had a box with my tacho in it and an envelope that brought dread. I opened the envelope from the tax office and noted with interest that the tax fonciere (tax on the land) is due on 17th October and the amount.... 855€. To put this into persperctive when we moved here in 2005 the tax fonciere and tax habitation (tax on buildings) together were 136€. Oh well, France needs the money. I removed the clock from the tacho, clipped the earth lead to the body and connected the live feed to the tag and gave the little wheel a spin. 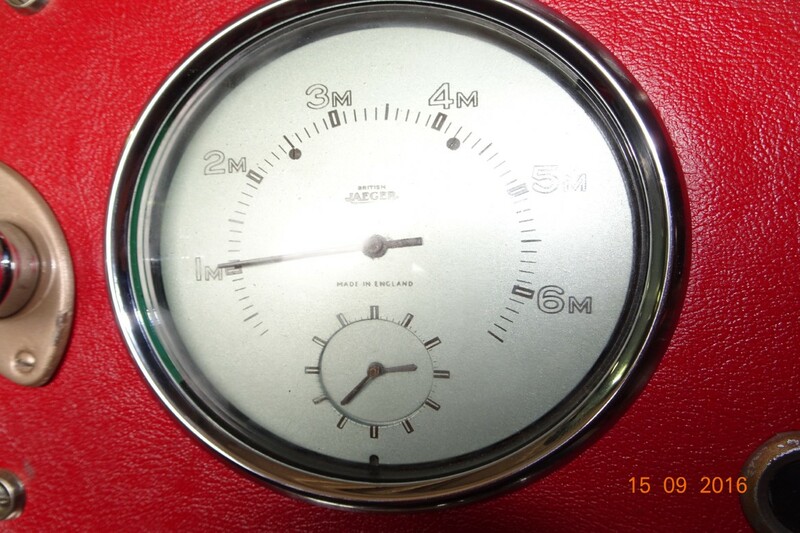 It started so I set the time at 1420 and fitted the clock to the tacho with the two earth leads on one of the screws that hold the clock to the tacho. 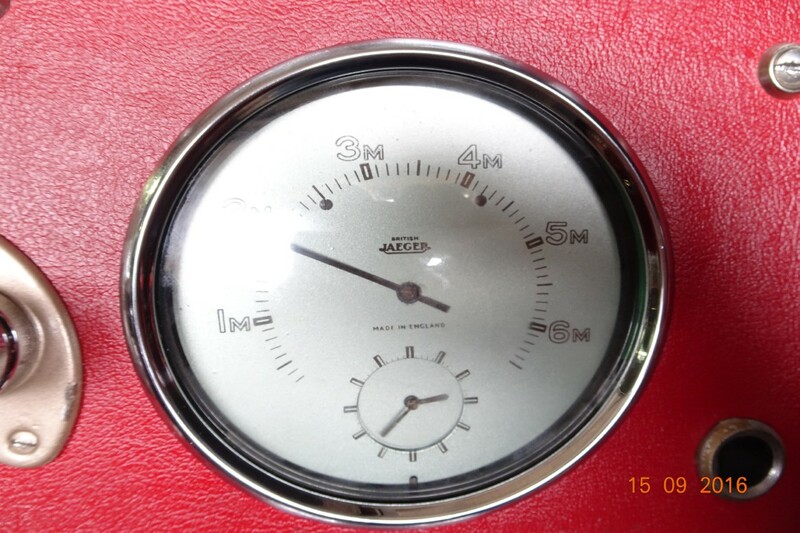 Then screwed the cable on and fitted the tacho into the dash. The bracket went on with the two brass grub screws. I then attacked the 4 screws that hold the door lock striker plate on and, in the end, took them all out and drilled the holes one size larger and fitted new, slight larger screws. Eventually I got them all tight but now the door doesn't shiut on the lock position but on the safety catch position. The car has to go back to the bodyshop for a small paint rectification to one of the front wings so I'll get them to sort it out. 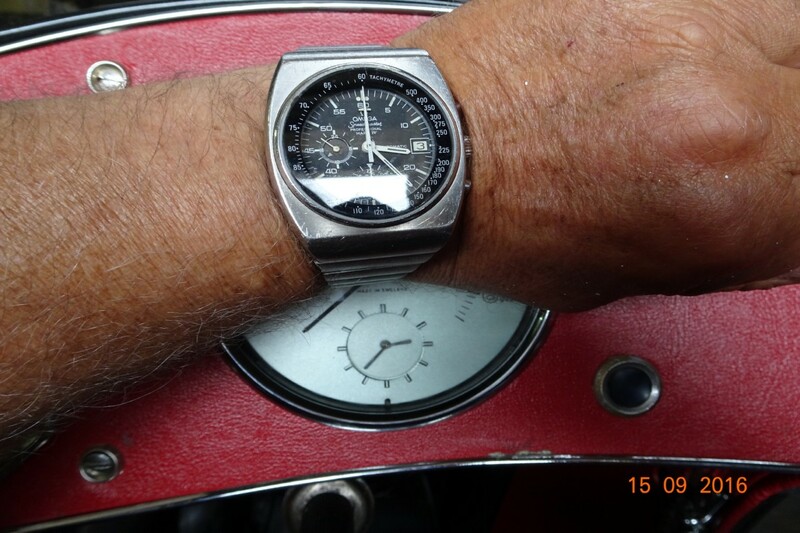 The tacho refitted and the clock has moved from 1420 to 1436... problem is the time is.1524. OK, so it worked for 16 minutes. ..... but doesn't come off. I've now pushed the outer cable in a bit more so tickover is about 500. I can manage without fast idle, I have a right foot that can do that. Went to physio, my shoulders and back and elbows are beginning to show improvemt. Just shows what a bit of sleep does. We then went to lunch at our friends Joel and Claude at Creveche D'or after which we went shopping. When we got back and got the shopping in, our guest got his MGB into the workshop. I jacked it up and checked averything to find the reported clonk. It's a US model and the only thing I found was the steering coloumn hard against the chassis. Having made sure all was tight I let it down and he took it out. I then removed my spare wheel and tightened the screws on the tank unit. Found two have stripped so I'll do a permanemt repair over the winter. The winter list is getting longer. I also got the four screws into the drivers door striker plate but the door will not close onto the lock catch only the safety catch. The car is going back for some minor paint rectification in the winter so I'll get Maurice to fix it then. Left at 0915 for Angers to visit Alex with his TC. I had no idea what I was wanted for. He has to get his engine out and replace pistons and rings and maybe fit new valves and guides. It smokes worse than a steam train and has low compressions on two cylinders. I had to fill up on the way and was due there at 1100. Got there at 1030 and found the exhaust and starter off. We fitted the starter, which looks like it may be from an MGA. It's a two bolt flange instead of three and has the solinoid on the bulkhead as per the MGA. Got that fitted and his wife, Muriel, collected us and took us back to his house for lunch. Very nice lunch with a glass or three of nice wine. We then went back to his garage and made a list of the parts he wants. I will order them on Monday and fit them in two weeks time. He is refitting the windscreen to his Jaguar XK 120 next Saturday. 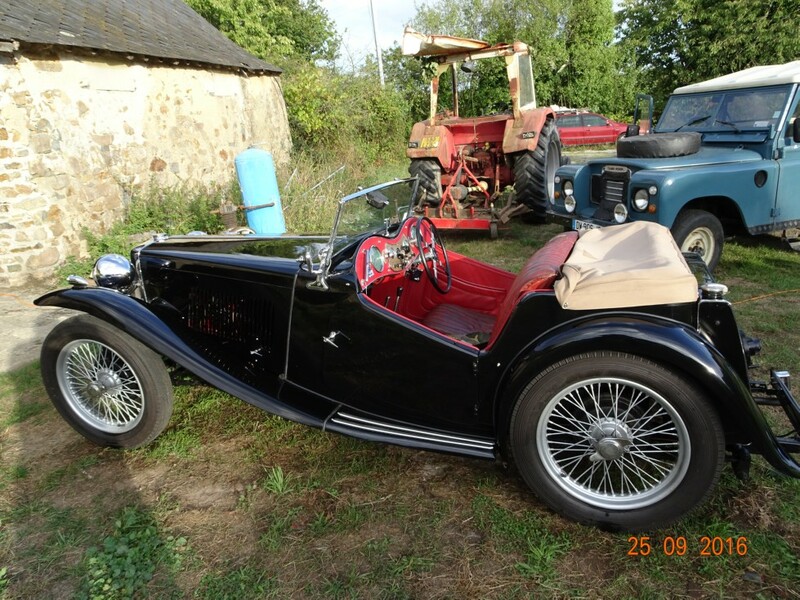 He also has a Triumph roadster (the one with the dickie seats), a Citroen 2 cv Mehari which are rear. Add to this lot two 1920's Citroens and you have a nice collection. He also has a two poster lift. I left at about 1500 and came home in time to watch the footbal on Final Score. 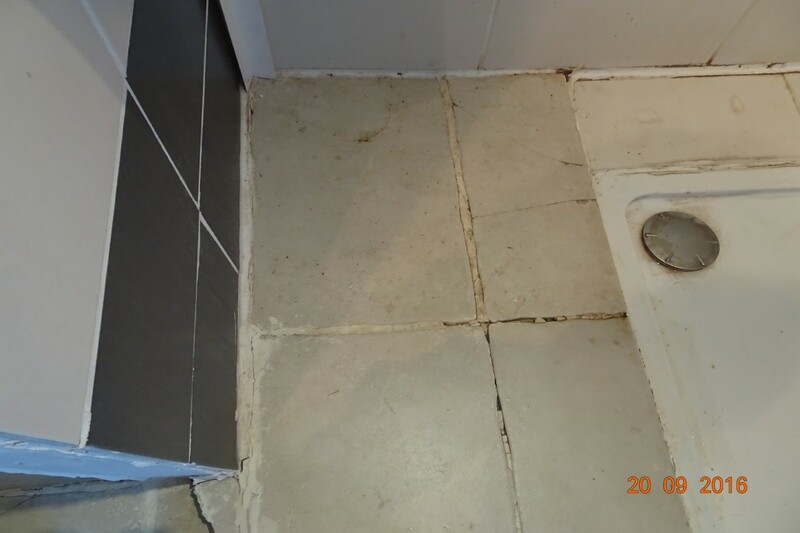 I went into the gites and removed all the bedding and put the Duvets and pillers in the wardrobes, emptied the fridges and removed all the stuff from under the sinks and put some mouse poison down. I then turned the electrcity off and left the fridge and freezer doors open. However I forget to turn the water off and drain the systems. Watched the tennis during the afternoon and Antiques Roadshow in the evening before speaking to Tanya for an hour. We didn'r get up until gone 1100 and by the time I'd looked at emails, facebook and ordered the parts for Alex it was 1200. Had lunch and then we started on the housework. Plan was to do the rooms downstairs and we got everything out of the alcoves and corners to sweep the dust out and then set the robot cleaner going. I got the ordinary vacuum cleaner out to vac the window bays and around the edges but found it blocked. I had to get the pipe off and into the workshop to unblock it. Having got it working I vac'd the window bays and the little piles of dust we had swept out of the corners. Then Lynne found the battery is flat on the robot vac so that was that. We'll finish it tomorrow and do upstairs. I then turned the water off to the gites and drained the systems down. I took the Caterham out of the garage next to the gites and went to move the ride on mower but the battery was flat. I pushed it back and repositioned it right at the back of the garage. I took the 6 chairs which are outside the gites into the garage and called Lynne to help me take the table in. 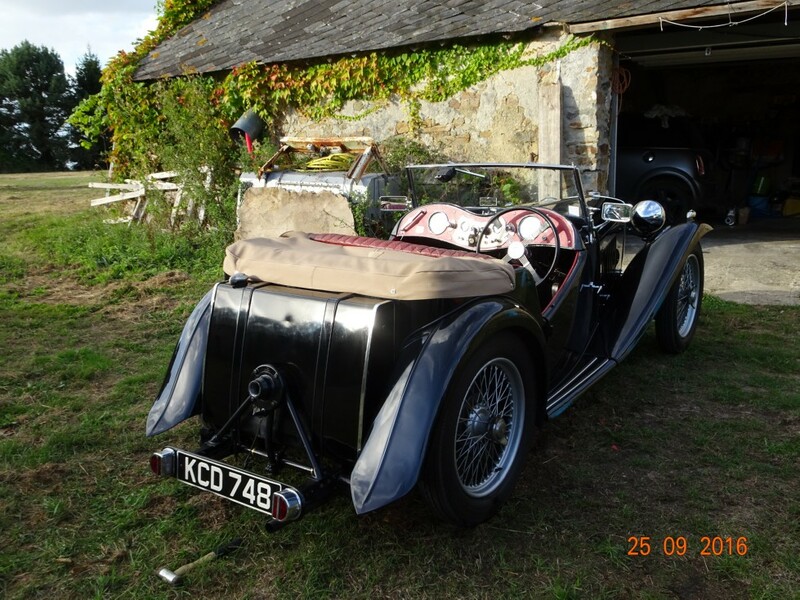 I had to put the sockets in the MG suite on as I needed to charge the battery on the ride-on the electric cable in the garage is connected to the socket in the gite. I then pumped up the tyres on the Caterham, had a cup of tea and went out in the Caterham. I sometimes forget just how quick this car is. I came onto the dual carriageway and floored it and was doing 185 kph in a few seconds. Slowed down a bit and had a nice three quarter hour drive along the dual carriageway and round the smaller roads back home. I'm now going to turn the compressor off in the workshop, see if the battery is charged on the ride-on and if so take the charger off and switch the electricity off in the gite. We carried on with housework. 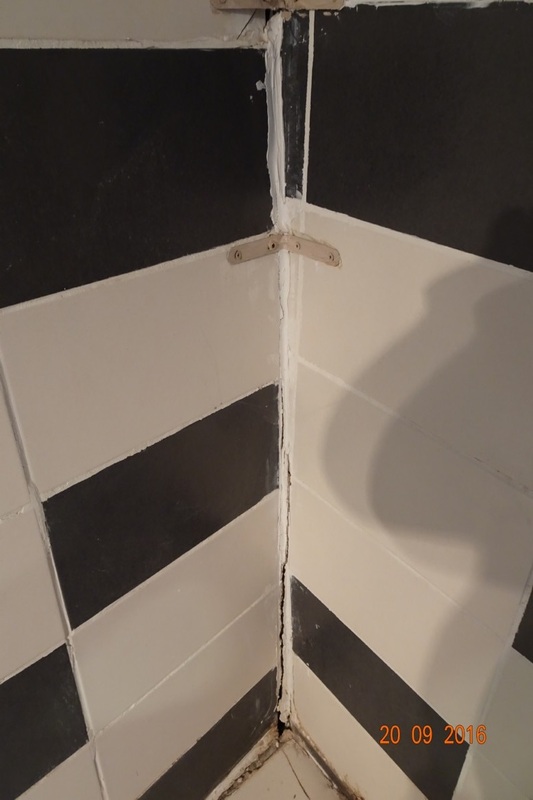 After lunch I went to Brico Marche and bought some 45 x 45 wood, some screws and paint and set to work on fitting the battens to the corner of the shower. The problem is that I put a 2440 x 1220 18mm marine ply board against the wall. The wall was the back of the chimney and the stone was crumbling so was very difficult to get battens fixed to the wall. As I'm not a builder I didn't put battens at the very ends and the ply is warping inwards leaving large gaps at the ends. I will screw the battens to the front and back walls and then use long screws to pull the warped wall back in. 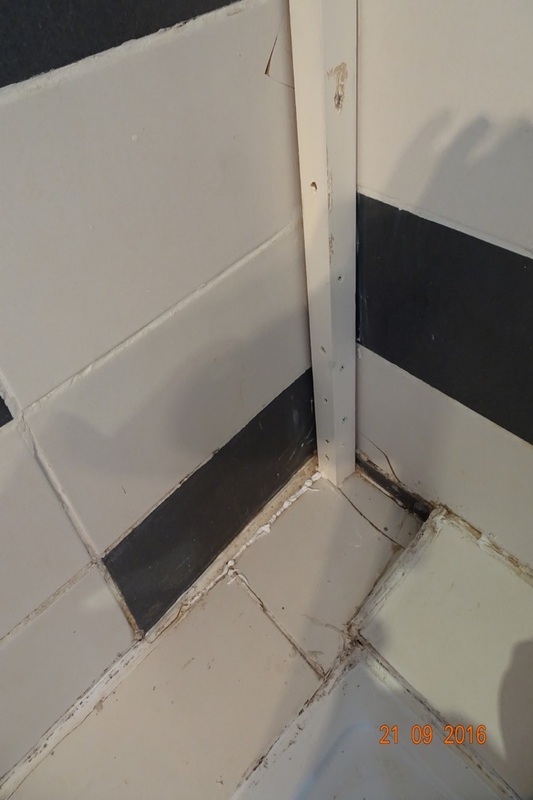 I also plan to steam clean the grout and edges to get the black gunge off. The gunge didn't all come off and I had problems with fixing the batten as the wood in the wall must be soft as the screws are stripping as I thighten them. I got an electric screwdriver and my drill into the shower along with the battens and screws. Having drilled the holes for the screws to the back wall I found the screws were to short. The batten was 45 mm and the screw 60 mm but with the small gap between batten and wall the screw wouldn't reach. So I went over to the workshop and got a 10mm drill bit to drill out half the depth of the wood. Did that and found the screwdriver wouldn't reach the screw head so went back to the workshop to get the extension for the screwdriver. It now reached and I got two or three screws in before the battery on the drill went flat. Back to the workshop to get the charged battery and put the flat one on charge. Carried on fixing the batten to the back wall and then the screw driver battery went flat. I carried on using the drill as a screwdriver but the found the screws weren't long enough to reach the warped wall. Back to the workshop to find longer screws. None there so over the the garage next to the gites and found two long screws. No wonder I'm worn out! The long screws were used to pull the wall in and then the 60 mm screws were used to hold it while the long screws were moved down the wall, I've left the two long screws in the bottom of the batten which has pulled the wall almost back into place. The four cm gap is now about 1 cm so that'll do. The bottom of the wall showing the gap caused by the warp. The wall with the batten in, pulling the side wall back out. 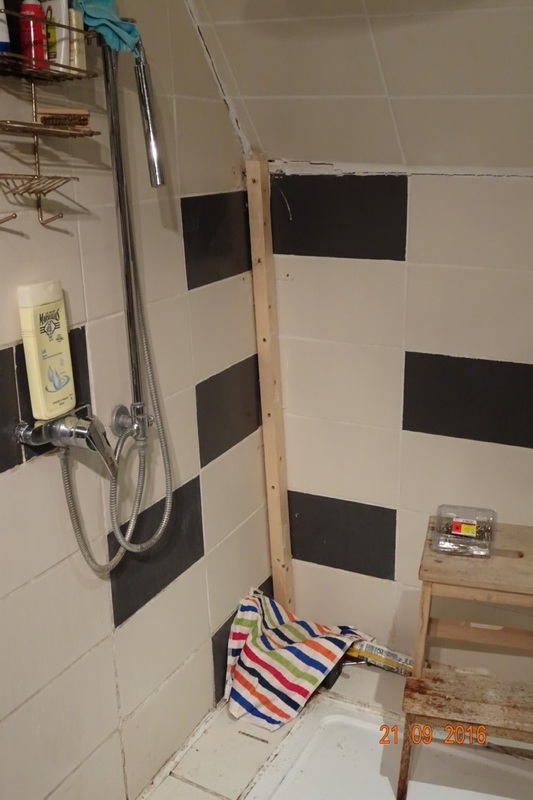 The towel is covering the drill and screwdrivers as we have used the shower and I didn't want the tools getting wet. Get back from physio at 1000. At long last my back is beginning to get better and my elbows with trapped nerves are almost fully better. The shoulders are nearly there. Lynne says she doen't feel to good and can we postpone going out until Friday. No problem, but I was looking forward to a day out. I'm going to paint the batten now so will take a better picture after. The bottom of the warped shower wall. 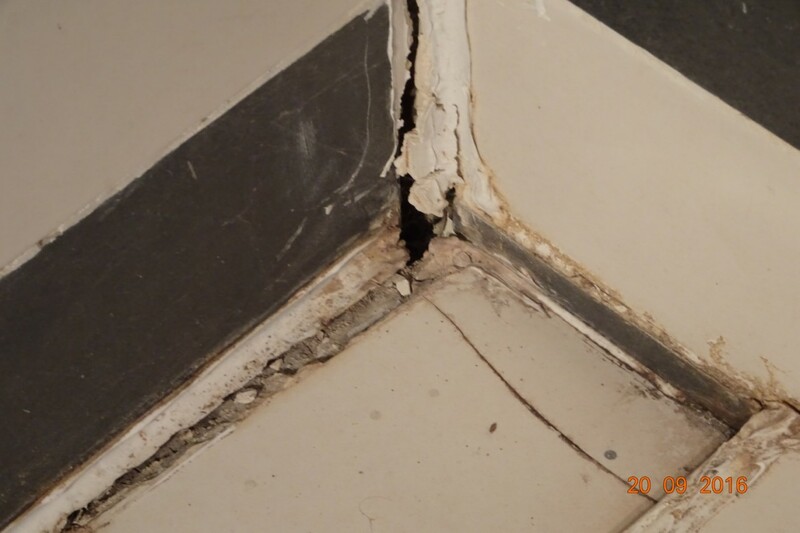 It's pulled in a lot but the screws are stripping in the wood, probably a bit rotten. I may take the whole thing to pieces and rebuld it ... next year. Got up late, had breakfast and got the tractor started. Had abit of a problem as the terminals on the starter had rusted and I couldn't get a good contact with my screwdriver to bridge them.... the starter switch broke about 8 years ago and they cost 60€ so I just bridge the terminals. I cleaned them up and it started. I then drove it round to outside the workshop to repair the transfer box gear lever. It broke in July. I had to take the bracket off and clean up the face on the wire wheel then do the same to the three quarte inch thick fulcrum pin and then weld the two together - again. All welded together I refitted the bracket, with the fulcrum pin on it, and fitted the gear lever over the pin and put the stop bolt on. So I started cutting grass at about 1130. By 1300 I had cut all the grass behind our house and in front of the gites. I stopped for lunch, had an hours sleep and started on the big field. Three quarters done and the belt jumped off the drive pulleys. 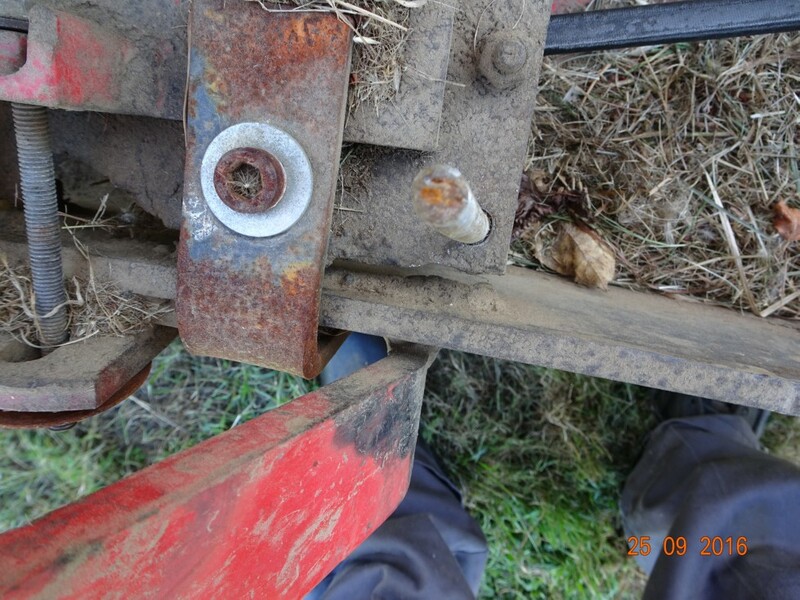 I took the tractor to the workshop and using a crow bar and large screwdrive got it back on. Did about 50 meters more and it came off again. Parked up outside the workshop and called it a day. We're going out tomorrow, as we didn't go out on Wednesday. I'll fix the mower on Saturday after I have taken a Land Rover full of rubbish to the decheterie (tip). I'm updating this, having a shower and will settle down for the night. That means fall asleep in front of the TV. I've no idea why but sat navs and I do not get on. After physio this morning we went out. I'd found a nice looking restaurant in Chateau Gontier. I'd set the address in our Tom Tom sat-nav. When we drove into Chateau Gontier, Lynne switched on the sat nav and we followed its directions. Took us to a suburb which was clearly wrongs as I knew it was in the centre of town. We ended up going for a twenty minute drive through the countryside and back in to town. I had looked up where it was on google maps so tried to find it from memory. After an hour we gave up, parked and found a bistro. Nice lunch, I had Herring salad and Lynne had eggs mayonaise to start then we both had duck with tagliatellie. I had Fromage Blanc with red coulis and Lynne had Chocolate fudge and ice cream for desert. Coffee (I had two cups) and 3 glasses of wine and the bill was 33€. We left te restaurant and found our way to the main road and went along to the turn off which would take us to Segre. As we got to the roundabout I saw the restaurant we were looking for! We'll go there next week. Got home, changed cars to Lynne's and went shopping. I've bought my supper, 6 Oysters, a crab and some prawns. I'll was it down with some cider. In the meantime do I throw the sat nav in the bin? I sort of fixed the tractor today, after spending an hour and a half cleaning the workshop, taking all the rubbish, mainly cardboard, to the tip, filling some cans with petrol and collecting Lynne’s prescription. I had to laugh at the petrol station. I filled 4 10 litre cans and there was a 5 litre can in the back so I filled that as well. About ¾ full I noticed there was petrol dripping out the back of the Land Rover. What a plonker! This can is the one I drilled a hole in the bottom as a feed for the engine to run on the workshop floor. But I couldn’t get a pipe screwed in so was supposed to bin it. I emptied what was left into the other cans and have left all the doors open for it to dry out. 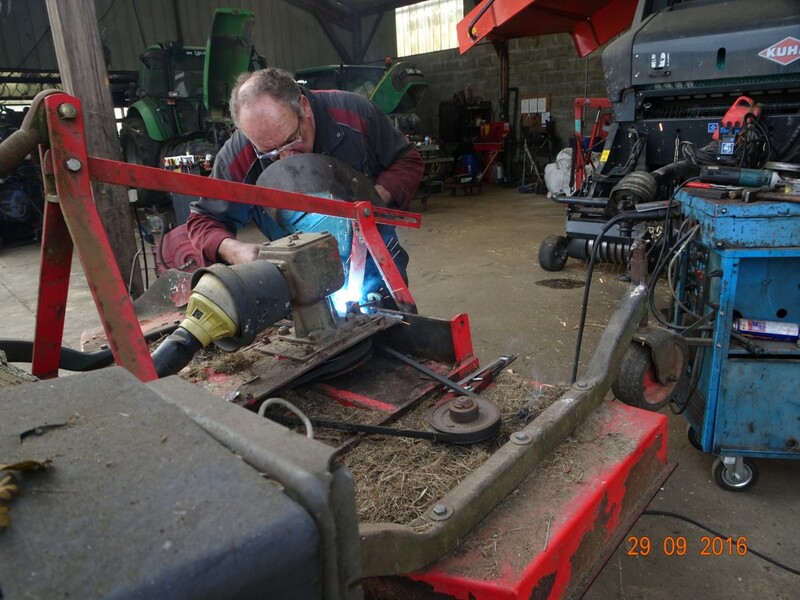 I had to align the centre mower platform to get the pulleys in line. I did this, but it won’t last. 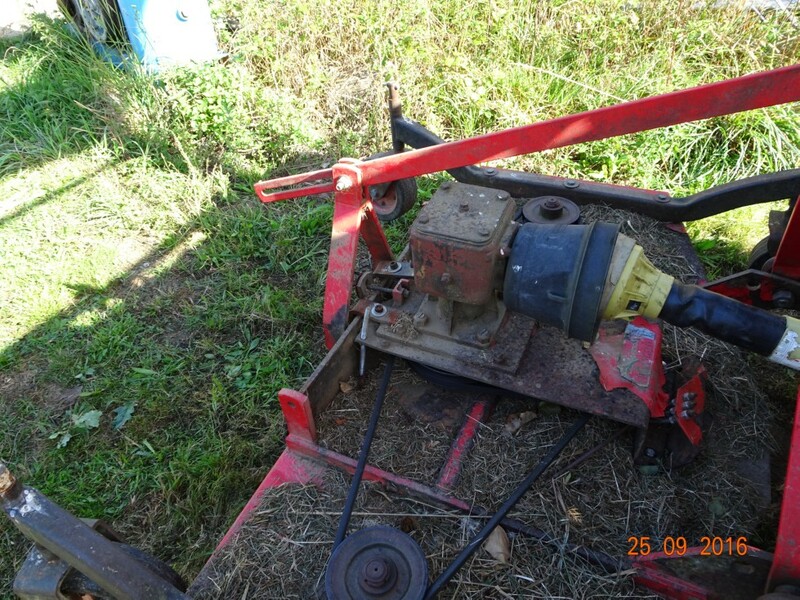 Then the transfer box lever, which I’d welded last week broke away so I finished off cutting the grass in reverse. 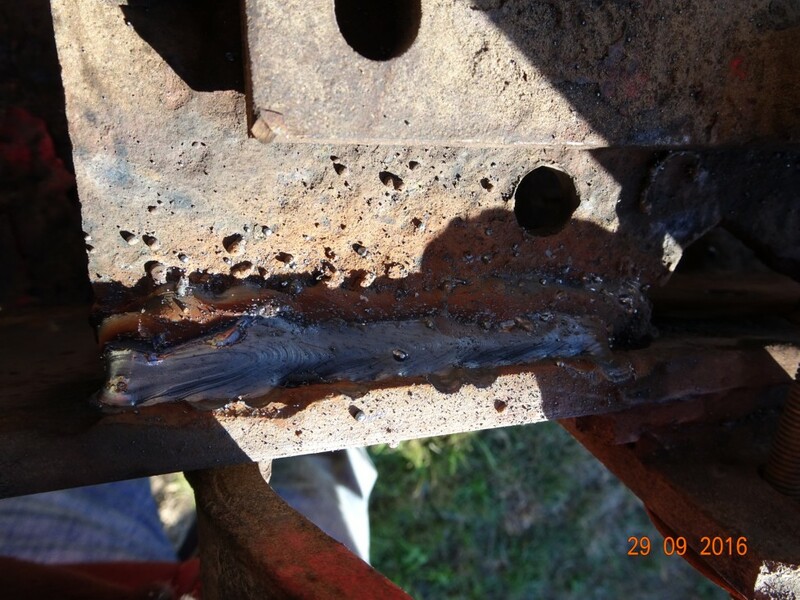 I’ll take it to the local tractor repairers to weld as my welder is too small to weld it properly. I’m going to try and get the engine out of the Mini tomorrow. Had a long breakfast and started work at 1030. I was going to get the engine out of the Mini. However, I thought it may be an idea to get the transfer box lever back on on the tractor. I removed the bracket from the side of the gearbox and the pin from the lever. Ground off the weld and then drilled out the screw which was broken off in the pin. The problem is I don't have a welding jet large enough to weld the pin to the bracket so I've now screwd it together. Works OK, we'll have to see how long it lasts. I then started on the Mini. Took about half hour to get the next bolt out of the bell housing as it has a bracket for all the wires and pipes. The bracket is across the top so the only way to get it undone is to use a socket. But then you cant get the socket on the bolt because all the wires and pipes are in the way. I had to lever the wires and pipes away then, it was so tight, I had to hit the ratchet arm with a large hammer to get it loose, Next was the bolt to get the plastic front panel off. I tried a 10 mm socket but that wouldn't fit but an 11 mm was too large. I Gave up and had lunch after which I fell asleep for two hours, OK, I've had enough of the Mini so I fix the driver door lock in the TC. There are four lock spacers on this lock and the outside handle is right on the edge of the square that turns the lock and is slipping off. I cut a piece of sponge, fitted it on the square of the lock and refitted the interior cover. Works a treat. I then washed and polished the car. There were oil streaks on the bonnet and petrol stains on the tank. Looks much better now. There are scratches on the N/S frong wing which will need attending to when the bodyshop repaint the O/S front wing which has rust under the paint. This will probably be in December. After all that I came in, sat in my massage chair and then had supper. A cleaned and polished TC. I guess it's worth all the effort. The Mini and I will be falling out very soon. I've never seen a car designed so everything is difficult to work on. The wire to the air con unit wouldn't come out and broke whilst trying to get it out. The exhaust flange under the gear lever, which must be undone to allow the mainifold to move away from the engine has a two bolt flange. Instead of having the orientation straight across, it's at 45 degrees. The bottom one is easy to get at but the top one allows only two clicks of a ratchet to turn. The front plastic panel is almost immposible to get off. I think you're supposed to remove the bumper bracktets, but the two large bolts that hold them on look siezed with rust so I just pulled hard. Then you have to remove the bottom swivel joint and track rod end from the hubs to allow them to be lifted away from the drive shaft splines in the hub and then remove the drive shafts from the transmission. I do not have a ball joint splitter, never needed one as a sharp whack on the end of a ball joint usually splits them. Oh, no, not on a MIni. 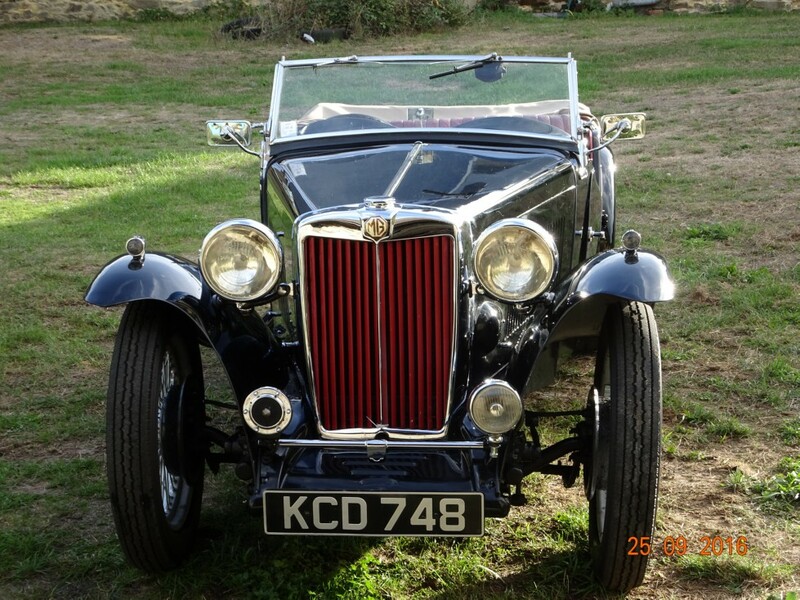 I'll try and buy one today.I have soaked the gear lever cable joints in PLus Gas and will attempt to get them off on Thurdsday, the next time I can work on it. So, get the drive shafts and gear lever cable off. Then undo the engine mounts, which should be easy and the engine should come out as a complete unit with the transmission. Hopefully on Thursday. Lynne went to the doctor in the morning as her blood pressure is up and down like a yo-yo She has a blood pressure tester and checks it daily. She took her machine to the doctor and he checked it against his. It's correct. He took her blood pressure three times in half hour and it ranged from 180 to 140 over... somthing or other. She has a letter to see a cardiologist at the Angers clinis tomorrow. We left home, the the MG, for Chateu Gontier to have lunch in the restaurant we couldn't find last week. Found it straight away and parked up. It was a bit early so we looked at the menu which was in a borad outside. We were not impressed so decided to walk up the street to find another. Now, as you may know, I get very tired walking, probably becuae my posture is wrong from my back. We walked uphill to the next street but no restaurants so came back, got the car and went back up the hill and turned right into the centre, We walked all the way through the centre but no decent looking restaurants. We walked back, past the car and went out to the main road where there was a little Italian Bistro. Had lunch there. OK, but nothing special. Came home and I was so tired I fell asleep for two hours and woke with a back ache and my legs and arms ached as well. I went to physio which helped my back a bit. Alex said he could feel my back wasn't right again so gave it a good massage. It's made it better but still hurts. I got back and we decided not to use the MG to go to the hospital but Lynne's Honda Jazz. I know where it is but as I haven't been there for three years we took the sat-nav. When we were close Lynne was reading the sat-nav and said to turn off at junction 18b. I thought this was wrong and it was. Due to road works we couldn't do a U turn to get back on the motorway for the next, correct junction so spent 20 minutes being taken around back streets to the clinic. We wern't late but it was annoying. At 1210 the doctor calls us in. He does a test with all the electrodes and says her heart is perfectly OK. He then asks her to go behind the screen and strip off. I can't understnad why she has to go behind a screen when she has stripped off he walks behind the screen when her top half is naked. Never mind, just me. He fits her up with a bllod pressure monitor which she must wear for 24 hours. It takes a reading every twenty minutes during the day and forty five minutes during the night. We have to take it back tomorrow. We leave and go to Atoll and have a Chinese lunch. We are so regular there that one of the girls now kisses us when we arrive. When we get home I fall asleep again. Had very little to eat and watched TV all evening. Didn't sleep much as my back, legs and arms hurt a bit. Not so much pain but uncomfortable. We had breakfast and left, at 1015, in the MG for the hospital. I've seen a restaurant along the side of the motorway (A87) which is the same chain as one we go to opposite Ikea at Nantes. I've looked for it on the web but cannot find it. We decide to watch out for it and make a note of the nearest junction. We see at as we go past and it's near junction 16, we get off at 19. The receptionist helps Lynne take the monitor off and we leave to find the restaurant. We turn off at junction 16, cross over the motorway and take the first right which is a no through road. The restaurant is at the end. These restaurants are called Boucherie (butchery) and specialise in meat dishes. Had a nice lunch and then made our way home. 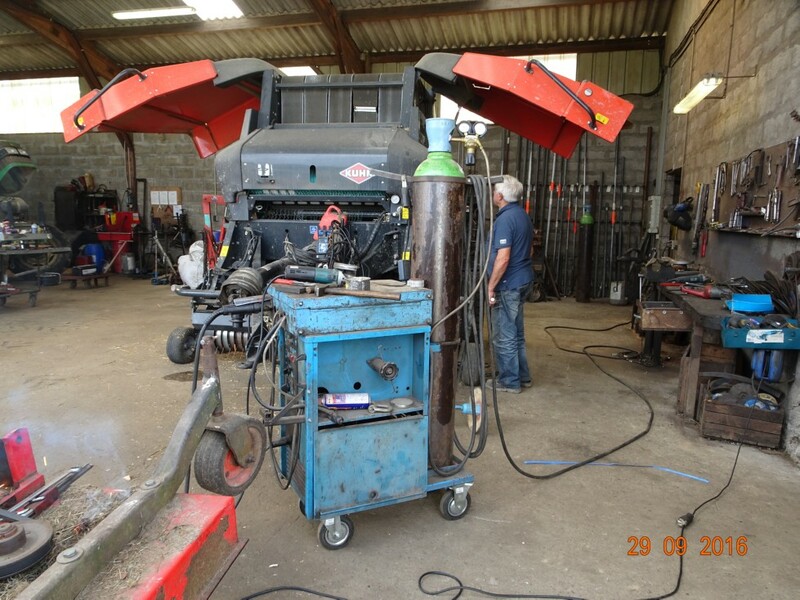 Got home at 1430, dealt with a few emails and then took the tractor to the tractor workshop in the next village for welding. 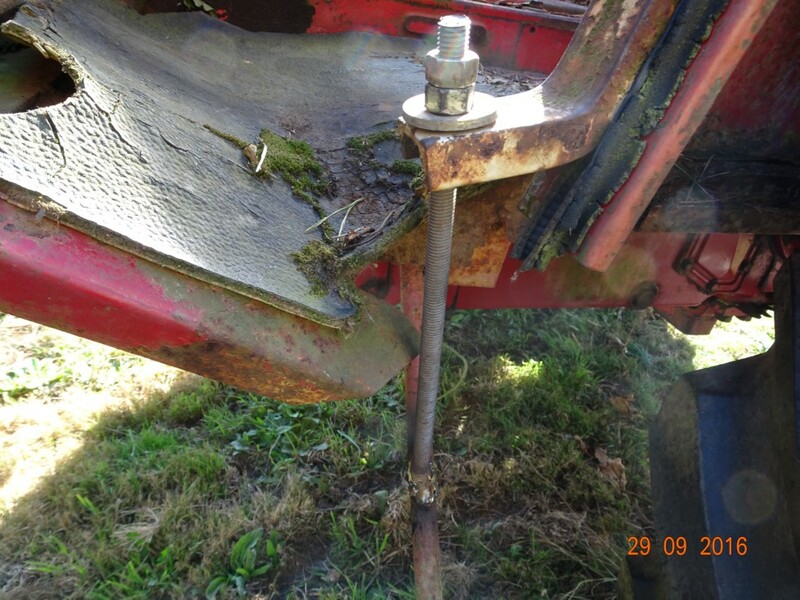 This tractor really shouldn't be on the road, the steering has about 1 foot of play, all the ball joints are worn. 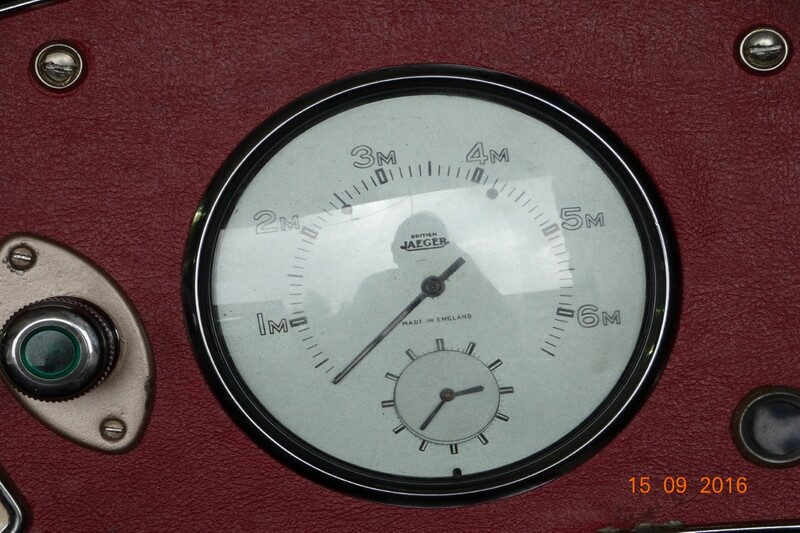 It's top speed at a sensible engine speed for forty three old engine is 16 Kph. Any way get there and the man welds the mower platform. 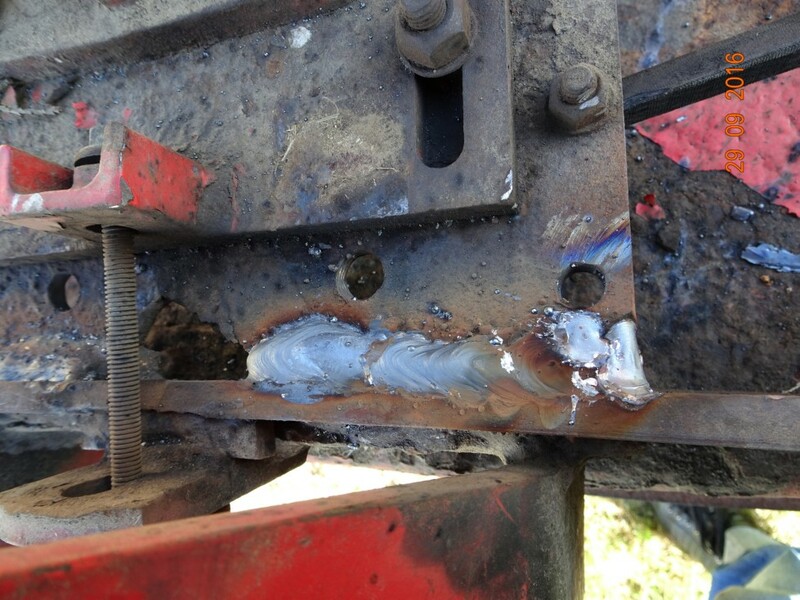 I then ask if he can weld a bracket to the left hand front of the cab to stop it rocking up and down! He looks at it and sort of scrathes his head. 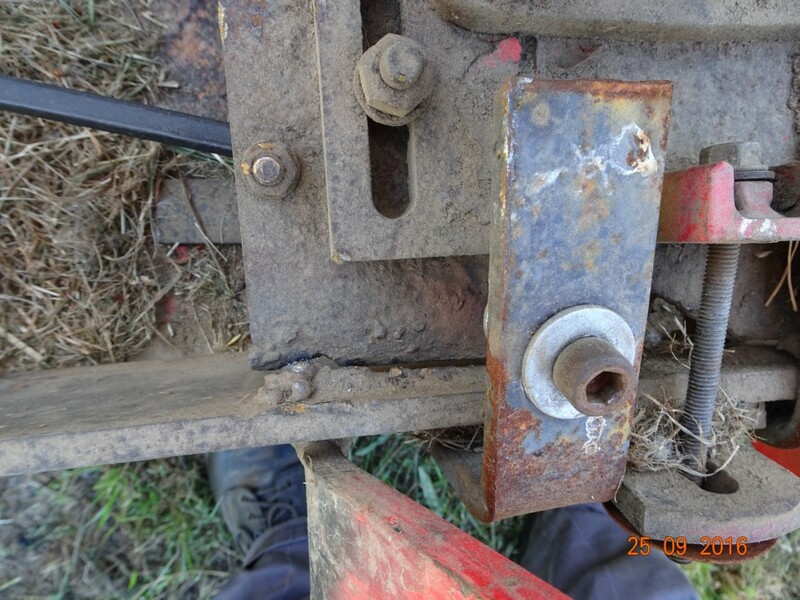 I say to wait whilst I get a length of threaded rod and suggest he weld the rod to the step bracket with the other end going through the hole in the cab bracket. 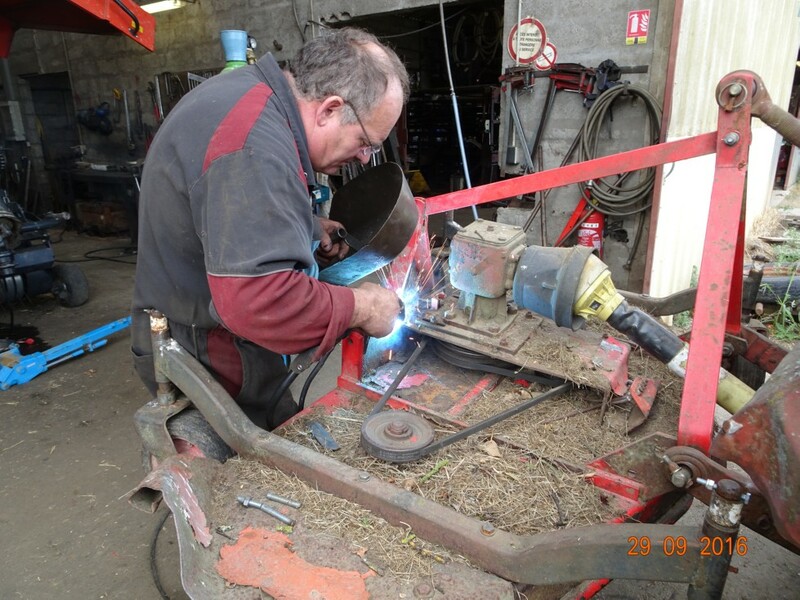 He has to widen the hole but he welds a length of rod to the step bracket, I cut it off to length with his angle grinder, fit two nuts, pull them down tight and job done - cab not rocking. I'm back now, typing this up and then I'll settle down and watch Flogit. 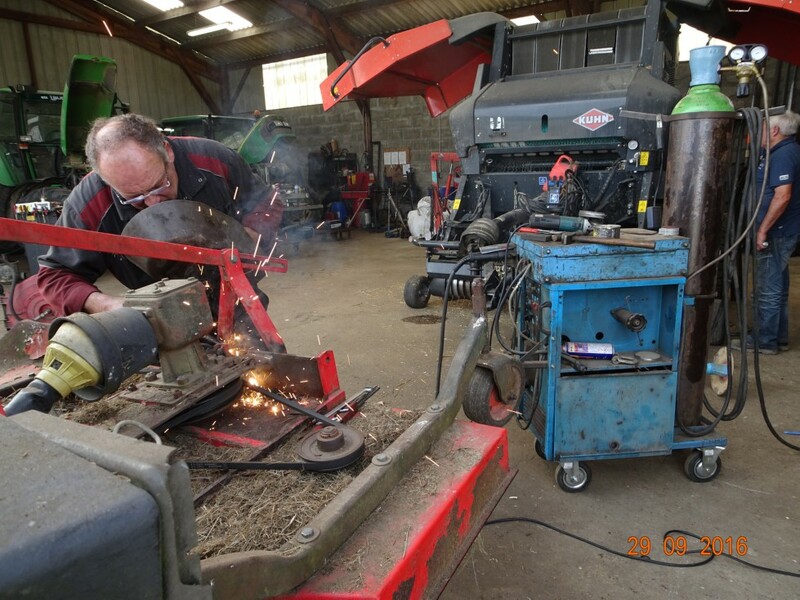 Mower plaftform being welded. I don't know his name but he's OK. It's easy with a big bugger like this. Beats my little portable oxy-acetyline welder. Just finishing off. Funny thing was before he started he got the airline and blew all the grass dust out .... all over me! .... and on the left. The threaded rod welded to the step bracket and holding the cab down, Before this the cab could move up and down as I've had to cut the windscreen frame off, which held the cab to the chassis. The other side is OK as it still has the angle iron going across the the front frame. I needed to take the O/S/F wheel off the Caterham to a tyre place as it had a puncture but the tyre place at Combree seems to have closed down. As we were near a new supermarket I thought it may be good to try it. They have a cafe so we had lunch. three courses, two beers and two coffees and the bill was 33€. We came out the cafe and stood at the front of the store and Lynne says she thought the young girl standing at the reception desk was the daughter of a (UK) friend. It was so they chatted for twenty minutes (three or four really, just felt like twenty). Got back, took the shopping in for Lynne and set of at breakneck speed for Chateaubriant to get the tyre fixed. No problem, it turned out to be a perished valve which was changed, Whilst the mechanic had the tyre off he wire brushed some corrosion on the inside and coverered it with black stuff. Tyre refitted and wheel balanced I bought a new rear side/stop bulb for Lynnes car (she's only been asking me since early summer), ant-freeze for the tractor and a litre of ATF which I will mix with acetone to see if it works as a de-ruster. I refitted the wheel and put the, now soaking wet, Caterham away. My friend from Nantes arrived at 1830 for me to drill and tap the two lower screws in his timing cover. It took longer to find two 10 x 1.75 mm setscrews than it did to drill and tap the cover and drill the sump. I then had a light supper and watched TV for the rest of the evening. Another month gone,where does time go. See you over in October.